So said Lee after the game and quite frankly when you step back from it all, two points is all we needed and two points is what we got, just……. We did our best to lose it, but in what was a heart stopping finale against the self-titled ‘Come back Kids’, we made it more of a struggle than it actually needed to be. None the less at this point in the season, it’s all about getting some wins on the board and we did that down in London yesterday. They just about took the first half, but we took the second despite that come back and scoring 6 tries to 4 we should have had it put to bed way before the end. I guess on reflection we made some stupid errors, particularly when giving away penalties, but our mental strength and a deal of tenacity saved us, as we almost snatched defeat from the jaws of victory. But, we actually deserved the win and the London Coach agreed with that assumption in his after match comments. We needed it too after last week! You know, I have said a few times of late, since 2016 I’m a lot more resilient and accepting after defeats and so by last Tuesday I had got the Wakefield debacle (and when you watch it back that’s just about what it was) out of my system. None the less, I thought a trip to London was always a potential banana skin and so, as I always need something to worry about, that then became my ongoing concern. That said, I guess I have to admit that a heartening display by Huddersfield on Friday night certainly bucked me up a bit! Just the same and as I suspected it might be, it was a real cardiac arrest job yesterday and thank goodness we managed to get home with those two valuable points. I always said that if we could get to 15 games with around 15/16 points in the bag we could kick on in the second half of the season, but first and foremost, you need that sort of bedrock to build on. So despite some alarms and excursions we are, for now, just about on course. However, as I say conceding daft penalties almost cost us yesterday and although some point to an off day by Sneyd with goal kicking as the issue, for me he will always have the occasional one of those and we have to cope with it. Somehow we got by at the Bronco’s, we battled, we prevailed, we brought the points home and after last week, what a bloody relief it was to do it!!! As I produced this, another through the night edition of the Diary, I mused on the fact that the away support of the FC this season has been nothing short of phenomenal, What’s more, the number of fans that made the trek down to the Bronco’s current home in Ealing was little different, with most fans getting a new ground ‘tick’ for the trip as well. Many like some of my pals and indeed the team, went down the day before and stayed over for the game, whilst the trip down to the capital just for the day on Sunday, wasn’t too bad traffic wise either. However, it was always going to be a tough one in South West London and their form and our possible complacency was, as I say, an ongoing worry, particularly after we had managed so easily to take Wakefield too lightly last week at the KCom. In that game we had all witnessed our three-game winning run come to a shuddering halt and the nature of the reversal hardly engendered much confidence about us performing in London. After that reversal we had heard how furious Lee was about that dismal 32-12 defeat. It had certainly burst the little bubble of confidence we had created on and off the field after those 3 wins! Mind you that is, as we have found out for years gone by, what happens when you underestimate your opponents, particularly when your Hull FC!!! As honest as always, vice-captain Taylor had conceded during the week that, “There was certainly a bit of complacency, we came out of that bad run and started winning again, and maybe we thought being back at the KCOM, where we’re normally good, that everything would happen naturally. We didn’t really work hard enough early on to get a foothold in that game, but we’ve learned a few lessons from that match and had a really good week’s training so now we need to get back on that winning run”. But, had we really learned our lesson? Well that was the million-dollar question, because often in the past we haven’t and although we were unbeaten on our last 5 visits to the capital, we have never been backwards at coming forwards, when it comes to over confidence in such situations, have we? It was a banana skin indeed and I’m sure that few who travelled down to the capital thought anything different. Several players agreed with Tag that we had experienced a good week at training and we’d had an outing or two on a synthetic pitch as well, but someone had to lead from the front and thankfully yesterday it was Taylor who was as good as his word. That pitch however, was the other big worry for everyone, because as 3G pitches go London’s has already been reported by Castleford to be not up to the Widnes standard and a bit dodgy to play on. Its certainly small, cramped and as are always such tracks, a distinct advantage to the home team. There was in fact an interesting insight in just how clued up Lee Radford is how to play on those surfaces when he said that the Bronco’s game was based on using their pitch to get field position, drilling the ball into touch and relying on the opposition making a mistake with the kick or setting a slow scrum as they, he said, “Bored teams to defeat”. That surface was something we couldn’t control, but a lot was still going to be on just how we turned up and applied ourselves against a team that would grind out the 80 minutes, use the advantage of that pitch, take their chances and (after that amazing come back in the last 5 minutes at Leeds last week) never give up and never give in right up to the final hooter. Their confidence was without a doubt sky high. So as the FC team ran out in those unfamiliar surroundings, the emphasis was firmly on it being a real test of our mental strength and fortitude as much as our playing ability. The game kicked off with a surprise as Ellis started and was destined to put in two stints. As for London, well we saw some typical no frills rugby from the off from the Bronco’s. So, as the first of way too many penalties was concede, the initial pressure came from London, as Dixon cut inside and got another penalty. That immediately caused us problems as they pressed on the line, we prevailed but it was hard going. However, some great play to release the ball in a tackle by Faraimo, after a Sneyd kick, saw the ball off loaded to Griffin who punched his way over the line for an unconverted try that saw us in the lead 4-0. 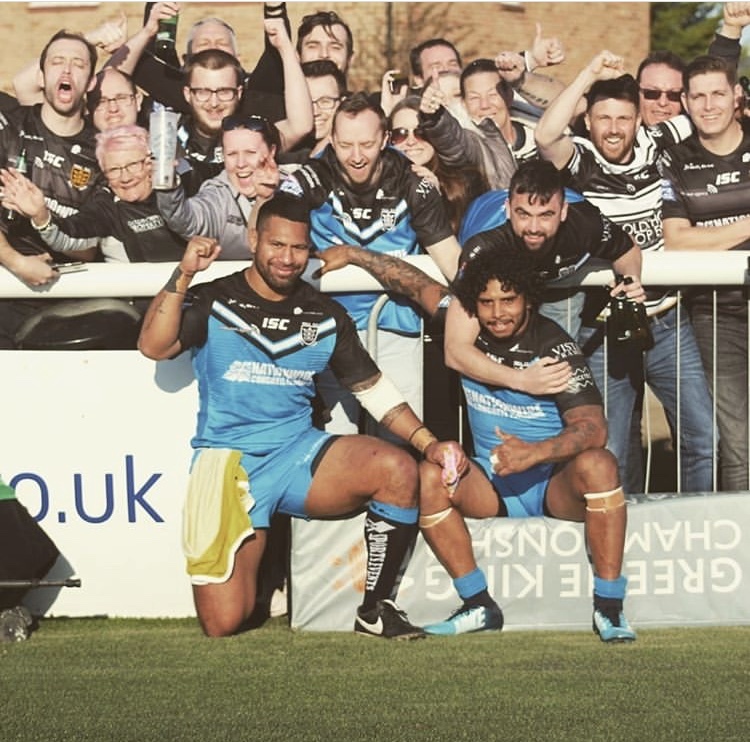 At last in a game of Rugby League in 2019 Hull FC had scored first!! Then on the very next set as we drove the kick off back up-field Manu dropped the ball under pressure and Kear walked in for the Bronco’s; at 6-4 we all wondered a bit which way this was all going to go! Both teams were muscling up in the line and next it was London’s turn to lose the ball on their line, but despite some probing from Kelly and Shaul, their goal line defence held firm. Then Griffin after great play by Houghton, crashed in on the first play after the Bronco’s conceded a penalty and again Josh was certainly looking pumped up for it. If we were looking for good omen’s, then it was good to see that we then completed a good set of six after the kick off as well. Penalties were soon hurting us again though and although Kelly broke away and should have passed to Ratu who was open on the wing we subsequently wasted the pressure, before back they came for Jamie Shaul to save us in the corner with a great tackle. Two more penalties conceded cost us again and they crashed in once more to score and although they didn’t look to have the ball down on the astro-turf, it stood and London were back in front. At that point we really did have to sort our discipline out, it was shocking in that first half and only a forward pass by the Bronco’s wide out near the line spared our blushes further. Playing the ball quickly and gobbling up the yards London looked to really have their tails up as the half drew to a close whilst we looked to be running out of ideas and as frustration took hold, Taylor garrotted their player and was lucky to stay on the field. However, the ensuing penalty from Dixon saw London go in 14-10 up and we had plenty to do as at half time to sort stuff out because I guess the neutral observer would probably say that the best team was winning. But we all knew the simple truth that conceding penalties was killing us again! We didn’t concede a single penalty in the next 20 minutes and that made the big difference. 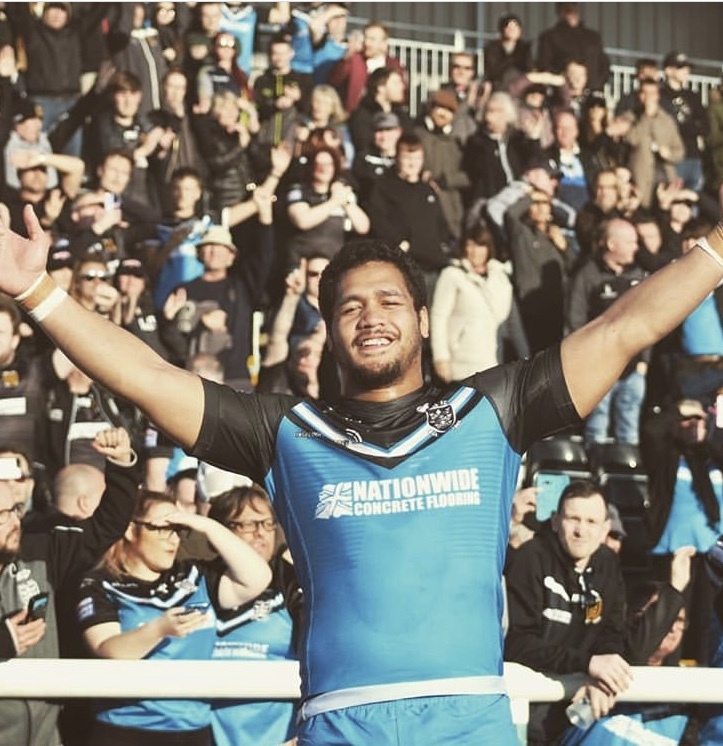 That second half was only a minute old when a great ‘flat’ pass from Albert Kelly found Tumavive running a fabulous line to render us level again, before from under the posts Sneyd gave us the lead. Then disaster struck as Shaul copped one near our own line and although it was hard to see what happened, Sneyd was apoplectic about the contact on Shaul, claiming it involved an elbow in his face. Jamie didn’t move for ages and he had to come off for the head test, as the referee put the incident on report. We got some ball and pressed on their line, as led by the imperious Scott Taylor our forward pummelled their way through the middle with much more conviction. Next up some more driving play from the forwards got us on the line and Jordan Thompson playing in the centre crashed through the defenders to score and as we all breathed a bit more easily, that should have been that, but how wrong we were to be proved! All we really had to do now, was play the game in their half and we did that very successfully in the next two sets. Then Albert Kelly ran down the touch line almost at half pace goading Williams as he went. The Bronco’s player dived at him and got a massive fend from Albo, before Kelly sprinted away to score one of the most unusual tries you’ll see this season; audacious or what? Sneyd missed with another conversion and that I felt at the time, kept London in it. You tend to take our conversion rate for granted don’t you, but even Marc is allowed the occasional off day! Ratu should have been in next, but after a great one handed take, he stepped in touch and London got the ball back and low and behold, just when we needed to compress the play in their half, we gave away another bloody penalty. They pressed, but somehow Paea picked up the ball off his toes from their end of set kick and drove us up field again. Then after a bulldozing drive from the fast emerging man of the match, Scott Taylor gave us great field position and as four London players looked dazed and confused on the floor, the ball was shifted by the mercurial Litten and in went Faraimo, off a great floating ball out wide from Sneyd. Predictably however and after another penalty, London were then at the corner and with 11 minutes to go it all became a bit worrying again. We had to muscle up, but a great kick off that bounced off the cross bar saw us pressing again and we should have scored on that set to put the game to bed, however, in fairness, London did well to defuse the situation. Back they came, but Griffin brilliantly defused a high ball from Abdull, before we let them in again at the corner after more poor spotting out wide undid us. The Come Back Kids were at it again!!!!! At 28-24 with five minutes to go it looked like a disastrous finale was on the cards, but somehow we just prevailed. Another penalty to London saw them knocking on the door, but a fortuitous knock-on, right on our line, relieved the pressure. But then in the final minute it was all happening as Ratu ‘cut Kear in half’ with a brilliant game breaking, back breaking tackle, before we conceded yet another daft penalty! Will we ever bloody learn eh? With just time for two plays we survived the first and punched the resultant kick out into touch as Williams closed in, as everyone heaved a sigh of relief and just about survived their regular FC heart check-out, once again. However, quite amazingly, that’s three away victories on the bounce!! We went there to do a job, it was a massive Banana skin, but with a great stint from Taylor leading the way to turn it round in the second half we hung on and quite frankly at this point of the season, on that pitch against that confident London team, it was all about the points and we got them ….just! The thing is of course, if Sneyd had kicked his shots at goal, or just two more of them, we wouldn’t have been troubled, but he didn’t and on a rare off day for our maestro, we got away with it. It was without doubt a great two points and as we stand played 7 won 4 and fifth in the table, I’m sure that after the first two games of the campaign, we would have taken that. But that wasn’t the real reason we were taken so close, because a penalty count of 14-7 (with 9 in the first half against us) coming as it did from our own stupidity and the naivety of referee Scott Mikalauskaso, (who got sucked in by some real drama queens in the London side), almost did the damage. We have to be more disciplined really, but who cares for we got the points and that’s the main thing. Plenty of other Clubs will go down there and lose so to get what we did will do for me! What was disappointing was the gate with 1000 from Hull and only 2,257 there in total in a ground that holds 3,400. Those who were seeking drama in London games this season have certainly not been disappointed, so where were the Londoners? What do the London people want? Bigger battles are ahead though and Warrington after a five day turn around, in the sort of form they are in is a big ask, nay perhaps after what we saw against Wakey last week, an almost impossible one on Friday. But for now, as the final hooter went and no doubt the radio’s went flying through the front room windows all along Preston Road, let’s just enjoy another two points, for as I said last week, the way it is all panning out, it looks like we will need all the points we can get this season. Well, to other things and he might not be quite ready for his first bow, but new recruit Andre Savelio is certainly having a go and I spotted him at the gym on the player’s day off last week, getting some extra’s in. As I said in the last Diary I think he’s a sound acquisition but for me, there is little likelihood that he will explode into the team, firstly because he’s been away from first team rugby for a long time and secondly because his signing was sufficiently heralded in the media to warrant him being given a bit of special attention by the opposition. However, after looking at the closed season acquisitions and the dynamic surrounding our current second row forwards, he is certainly a welcome addition. Now, as I said last time, I do worry a bit about things sometimes and it happened again this week when I read that our head coach was explaining to the media on press day about the FC’s ‘tiredness’ against Wakefield and it being the reason that we so obviously struggled to cope with the Wildcats pack. As such he commented that as we approached the London game, he was hoping that a space of nine days between the two fixtures would be enough time for his side to ‘rest up and recuperate’. Lee added, “Up until that game it was the little things we’ve done really well, the change in tempo, our kick chase and the kick pressure has been phenomenal for five rounds and it’s helped our backfield out massively, but those efforts weren’t there to see against Wakefield. Loads of blokes looked busted and loads of blokes looked fatigued and after a good seven-day turnaround you don’t expect that”. No you certainly don’t, but perhaps that explains the demeanour which seemed to effect so many of the team that night??? Surely after just 5 games professional sportsmen shouldn’t really be tired should they? And if they are? Well, heaven help us all after we’ve played 30 odd! Furthermore, if that was what was behind that showing against Wakefield, was it down to us flogging the players too much in training, because if they are as fit and healthy as we are told they are, that’s really the only explanation. When I read that comment by Lee, I have to admit to wondering a bit!! We only play for 80 minutes a week, we have already had one weekend off and as a group we really shouldn’t be tired when we are just a fifth of the way through the season should we? It was an odd comment by our Coach I thought didn’t you? Now on Wednesday I was talking to some of the folks who were in attendance at the first members meeting of the season at the Clubs offices. It was an good night apparently, if not poorly attended, but one of the interesting things to come out of it was the subject of fans travelling to away games and how they get their tickets. The Super League Clubs have been concerned for a while about the amount of ‘action’ a club gets selling these tickets to their own fans, who intend to travel to an away game. It used to be 20% then 25% but I’m not sure if it’s not even more now. So, it’s obviously a great way of increasing a Clubs income and means that loyal fans will be able to ensure that their own club gets something from their travelling away to see their heroes. I imagine our cut is a substantial amount of money particularly with the amount of FC fans that travel and particularly in the case of say a local Derby. However, that only helps if everyone buys their away tickets in advance from the Club shops. As fans we have to always be mindful of doing everything we can to help our club and by buying from those outlets, you still only pay the face value of the ticket, but half that money goes to your club, whereby if you travel to the game and pay on the turnstiles it all goes to the host Club. If you live a long way from the Stadium then it’s a hard one I know and I understand that, but they are usually on sale prior to the previous home match and at present the next 4 are on sale. Really it’s a no brainer and because times are always hard for RL clubs, I appeal to you all to do it that way if you can. Last weekend in the Dog and Duck in Beverley, whilst everyone seemed to be watching the England Rugby Union game, I commented on what a mess their loose rucks are at times, to which an ardent follower of Beverley RU retorted, “Well your play the balls are little better these days”. I didn’t need to think much about his comments before agreeing with him, because that was something that had quite amazingly been occupying my own thoughts earlier in the day. Talk about serendipity eh? You see, last weekend after that poor showing against Wakey and a night trying to write up the game and my feelings about it for the Diary, I switched on Sky and enjoyed that great summertime Saturday morning pastime, watching an NRL game. After an absolutely nightmarish ‘closed season’ of outrageous player behaviour Down Under, which I catalogued two weeks ago, it was a great weekend of games with Aussie and British TV audiences and real time attendances over there up as well. Melbourne were great, Cameron Smith goes on forever, a new star was born in Adam Reynolds and the speed and discipline of the players was a joy to watch. I was in fact reminded again that however loyal you are to the British game; you can’t help but admire it all can you? Our product is improving. Last week in here I suggested just how much it is and we have seen some great televised games over here this year as well, plus of course, attendances and all viewing figures are on the up too. However, last weekend after watching the Aussie game, I tried my best to decide why there is still a big difference in the spectacle and came down on the side of the way the game is played and controlled over there. I don’t know if it is the two officials and the fact that one concentrates on policing the play the ball, but my thoughts particularly focussed on how the two countries application of the games rules in and around the ruck, differ considerably. In the NRL they rigidly apply the letter of the law, where the rules require a tackler to role away once ‘held’ has been called and the tackled player to ‘Regain their feet and propel the ball backwards with the foot’. They insist on that and the merest hint of the action not being completed exactly in the spirit of that law, sees players penalised. Here in Super League watching the corresponding games both on TV and live at the KCom that weekend, I decided that the play the ball in Super League is descending into a right shambles. Furthermore, watching Wakefield and Warrington last Thursday, I also deduced that more and more players are milking that part of the action, as some appear more intent on trying to get a penalty for ruck interference than actually getting on with the game. That for me is down to just one thing; the lack of the rule being applied properly by the referees in the UK and in turn them being constantly conned by players trying to get a penalty. In every British game I’ve seen in the last 7 days I’ve witnessed (sometimes 3 times in a set), players rolling the ball back with a foot nowhere near it and furthermore, they often did that falling forwards onto the defending player who was trying to get up having made the tackle; thus making it impossible for him to get out of the way. On other occasions some player moved forward off the mark up to 4 meters, crawling on their knees, before trying to get up and I wonder if I’m correct in thinking that perhaps teams are coached to do this in certain situations, just to take advantage of the intransigence of the official? I read somewhere that to implement the letter of the law in such cases would slow the game down, but it doesn’t in Australia does it? For over there the game is even faster than ours! In our match against the Wildcats and the Rovers televised hit up against Catalan, I saw players wrestling to get up after a tackle, so that they could step over an opposing player who had been injured or even knocked out in it, before they then played the ball back ‘at’ them, to get a penalty. Surely that has to constitute moving off the mark doesn’t it? A bit like the occasional habit of acting half backs throwing the ball at an opposing player who is stood off-side, but not interfering with play, if it’s not tantamount to cheating it’s certainly bending the rules and not in the spirit of our great game in any way. Perhaps having a second official on the field who concentrates on the play the ball will help, but for me, allowing any leeway on this stuff, in the spirit of keeping the game flowing, allows a creeping process of players ‘bending’ the law to see how far they can go and get away with it. I’d stop a player stepping over another to ‘get on with it’ but rather make them step back and as is the case in Australia, players should have to regain their feet and their balance, before they play the ball backwards with their foot. I’d also stop that other trend that is creeping in where the tackled player crawls forward on hands and knees, off the mark, to play the ball. In the NRL I watched on several occasions when the referee made a player in such a position go back to where the tackle was completed and even penalised offenders a time or two for crawling forwards. If we did all that the game would still be fast, because it still is in the NRL, but I have to agree with my pal in the pub because watching a few of the play the balls in the British televised games this last week, where players were falling forwards into two tacklers before throwing the ball through their legs, it did resemble a RU ruck and we don’t want that do we? Just of course my views! 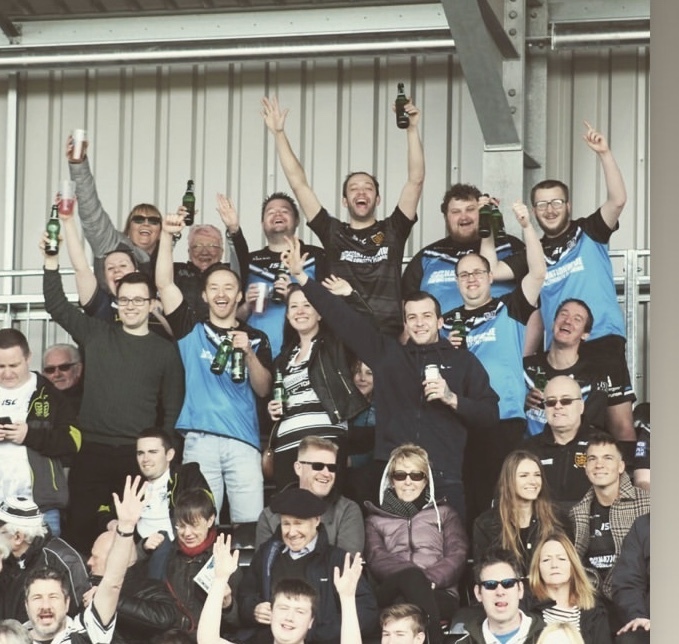 So to this week’s Codgers spot and as I have often said in here, the 1970’s for the most part, or up at least to the last couple of years of that decade, where a bleak time for any supporter of Hull FC. Although under the leadership of coach David Doyle Davidson the club battled to a John Player Final and showed real signs of improvement, they were hard times on and off the field. The Doyle slowly built a team that was a mix of youngsters, old heads and a few really class players, but gates were poor and money was tight and it was only when Arthur Bunting took over the coaching reigns and the purse strings loosened, that things started to improve. Arthur, it is generally accepted, capitalised on the years of hard work that David had put in and used the assembled team as a base to build the squad that took us through the glorious early 1980’s. Many of the stalwarts of that depressing period in our history like Nick Trotter, Tony Salmon, Alan Wardell, Don Robson, Mick Kendal, Bill Ramsey, Mick Sutton, Dave Marshall, Chris Davidson, Brian Hancock, Tony Banham and Barry Kear, were all either too old or just not good enough to continue into that golden era. In fact, many players from that period like Terry Kirchin and Lenny Casey have passed into the mists of time but have in the past still warranted a spot in Codgers Corner. However, a few players like Graham Bray, Keith Tindall, Alf Macklin and this week’s featured player, did make the transition and played at least a part in the most successful era the club has probably ever experienced. A one club player Keith Boxall was a real fans favourite back in the 70’s and he went on to play a big part in the start of the process in elevating our club to the top of the RL tree with some fine performances late in that decade and early in the next. He signed in 1968 from Eastmount YC and made his debut on 28th March 1970, although I had watched him in the A team games of ‘68 and ‘69 where his tackle busting running saw him a hero long before his first team bow. Despite only playing 4 games in 1973, due to injury he was otherwise, a real “ever present” and fans favourite throughout the decade, and over on the Threepennies, we worshipped ‘Box’. I loved to see him rampaging down the field in broken play in that classic style that earned him the nickname of “The Rhino”. He scored over 40 tries in the two seasons that saw us in that John Player Final and then gain promotion to the first Division, and in fact in 1975 his 21 tries were the top scoring record for a forward in the game in this country. The other thing was of course he could kick goals too, and although in his later years Sammy Lloyd took over those duties, Keith still managed to kick 207 goals for the club to add to his career total of 98 tries. However, it is not that scoring record that makes him a lasting memory in the minds of anyone who watched the club back then, it was the sight of a stocky, blonde haired dynamo crashing and bashing his way up the middle of the field swatting off tacklers as he went! It was an awesome sight! I remember going to Salford to watch Hull play the top team in the country at the time, in the John Player Semi Final in 1975/6, when we, as a second division team, were literally given no chance at all by the pundits of beating the “Red Devils”. They should have known better because under DDD’s astute coaching, we had already beaten Leeds and Saints en-route to that semi-final clash at the Willows. The date was 13th December and it was a freezing winter’s day under the floodlights at Salford, but the quality of the game and particularly Boxall’s performance will stay in my memory forever. Keith just seemed to be unstoppable as he burst through the Salford line time and again and this saw him score two tries in a memorable 22-14 victory that even had Eddie Waring scratching his head! “Rhino” carried that form into the final and the following season when we were promoted to the First Division, he scored 20 tries and played in all but one of our 37 games. Keith Boxall maintained a high level of consistency throughout his career and during a decade that saw the club’s fortunes fluctuate considerably, he never seemed to be “Off Form” and always gave 110% for the shirt! Perhaps, I guess his greatest moment was when he started in the 1979 BBC 2 Floodlit Trophy Final win against Rovers! That was a great night!! Keith played his last game for the club in 1981 when he was deemed as sadly being too old to continue any further into the 80’s that were so successful for our club. We will always hold the Knocker Norton’s, Peter Stirling’s, Lee Crooks and James Leuluai’s in great awe and reverence, because they were the big stars that have blessed our club over those years, but for me there was none better for loyalty, endeavour, guts and determination than Keith Boxall. He played a total of 285 games for the black and whites and was the stuff that our great club is made of and over the years that I have known him, a nicer bloke you could not wish to meet!! Found this the other day! 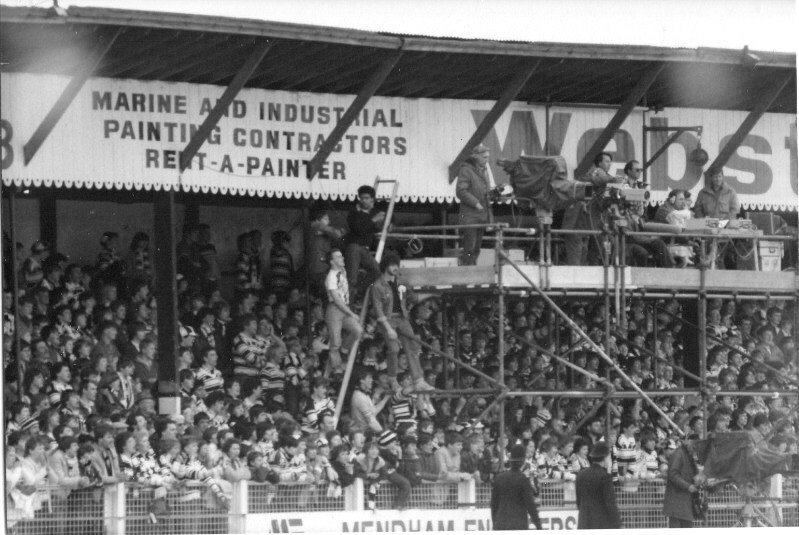 Note the guys up the ladder with their Hull rosettes on, I can’t imagine that sort of thing these days can you? Well, here we are and already a quarter of the season has passed and it’s all boiling up nicely across Super League. London and Salford, tipped to be drop candidates have gone well in a campaign were, for the first time since 2014, Super League teams are vulnerable to the drop without the safety net of The Qualifiers. That could, as the middle third of the campaign unfolds, add a lot of spice, particularly given the current state of champions Wigan and Leeds. In previous years, while it has been a surprise to see the likes of Leeds and Warrington finish in the bottom four, we never ever really believed that they were at risk of relegation due to a convoluted and indeed Super League loaded bias. You all know I campaigned in here for getting rid of the Middle Eights and indeed got some stick for it, but the high level of competition at the top of the Championship and the state of Super League at present, certainly makes me feel that I was right! Thankfully, all that confused structure has gone now and although we’d expect Leeds and Wigan to turnaround their current form relatively quickly, it will be interesting to see how long they can hold their nerve, before heads role. Who will be the first managerial candidate to depart do you think? It’s interesting to see in the RL press that before this weekend and Wigan’s win, some pundits are already questioning the positions of both Adrian Lam and Dave Furner. I guess at this juncture it’s hard to see much further than the relegation battle still coming down to Huddersfield and London, though in a long season and all those loop fixtures still to come, it could be down to which team has the most injuries and who has the most strength in depth to cope with them, some, like Hull KR, will be starting to worry a bit about that. As for us lot well, we should be OK I think, but you never really know do you, so that was two great points gained on Sunday. At least we have the depth, although as I said earlier in here, a team that is, by the coach’s admission, looking jaded after 5 games, has to be a bit of a worry. Still this week against the Wolves is a massive ask and as I sat there watching the TV, Wakey, our vanquishers by a country mile last week were put to the sword at home in the first half by next week’s visitors Warrington. For three quarters of the game the Wire controlled things so well both with and without the ball, although like us lot at the Bronco’s, they dropped off a bit in the second half. However, we couldn’t even control the Wildcats at the KCom, so on face value it looks a really big ask. Of course every game is different, but it’s a 5 day turn around for us and a 8 day one for the Wolves, so do Lee Radford’s concerns about us already being a tired squad come into play? That was, as I said earlier, a worrying comment for me after just 5 games! I guess we’ll just have to wait and see. One thing is for sure Radford certainly rejoices when the message to the players actually gets across in games and his delight on the final hooter yesterday as he hugged Andy Last, was compounded by what he said afterwards. There is little doubt it’s the little wins that make a coach happy and Lee said afterwards, “We’re relieved, but there’s a bit of satisfaction as well. We had set ourselves mentally for that.” So for this week at least the Psychology had worked and well done to the coaching staff for getting it across to the players! Now Sadly, for reasons beyond my control. I’ve some stuff on this week and so THERE WON’T BE A DIARY NEXT WEEK. I’ll be watching the Warrington game as usual but all this rubbish won’t be back, until the week after the Salford game, (8th/9th April) when we should then have a good run of Diary’s up until mid-summer. I’m sorry for that, but I guess if I’m honest, I do get a bit embroiled in it all and a break when its enforced, as this one is, perhaps comes as at a good thing for writer and reader alike. Thanks as always for all your support this week it’s been great to hear from you and to the 1000 or so who went down to the smoke yesterday a big ‘Well done! !’ I’ll be back a week on Monday! But ….. I wonder what Friday will bring eh? 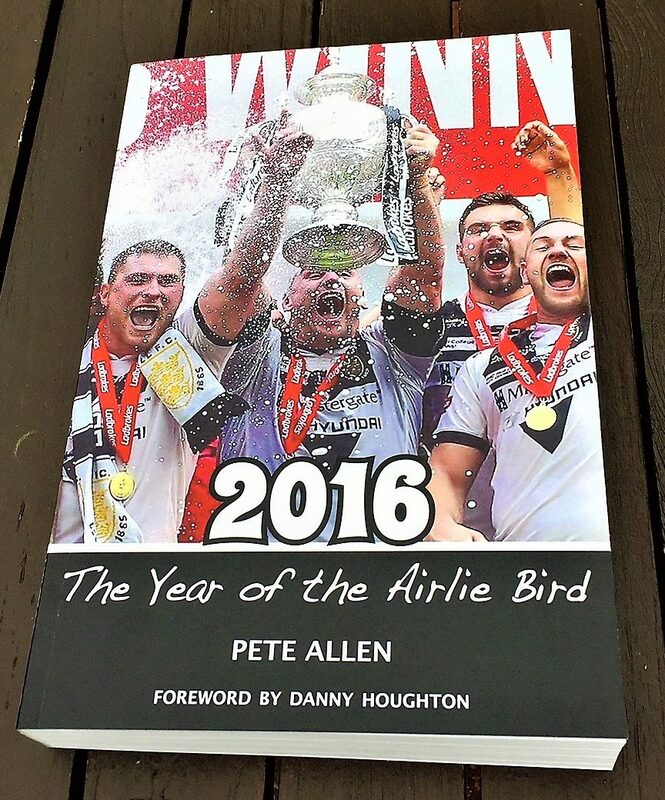 On sale now in Hull FC club shops. All profits go to the Danny Houghton Testimonial Fund.